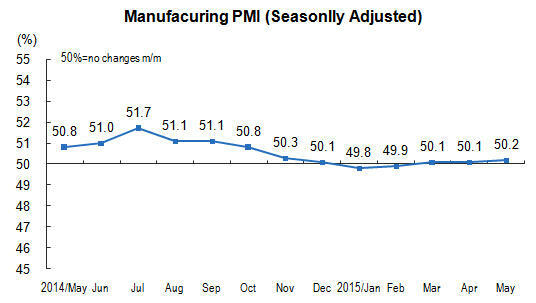 In May 2015, China's manufacturing purchasing managers index (PMI) was 50.2 percent, 0.1 percentage point higher over last month, and higher than the threshold, the manufacturing expanded modestly. In view of the sizes of enterprises, the PMI of large-sized enterprises was 50.7 percent, slightly increased 0.1 percentage point month-on-month, continued to stay above the threshold; that of medium-sized enterprises was 50.4 percent, having increased for two consecutive months, and rose above the threshold for the first time in this year; that of small-sized enterprises was 47.9 percent, down by 0.5 percentage points month-on-month, still stayed in the contraction range. Among the five sub-indices composing PMI, the production index, new orders index and supplier delivery time index were still higher than the threshold, while the employed person index and main raw materials inventory index were lower than the threshold. Production index was 52.9 percent, increased 0.3 percentage points month-on-month, and was higher than the threshold, indicating that the manufacturing production kept on the tendency with steady increasing, at a higher growth rate. New orders index was 50.6 percent, increased 0.4 percentage points month-on-month, and stayed above the threshold, showing that the market demand of manufacturing sector continued an expanding trend. Employed person index was 48.2 percent, increased 0.2 percentage points month-on-month, and was below the threshold, indicating that the labor employment of manufacturing enterprises continued to decline. Main raw materials inventory index was 48.2 percent, kept at the same level over last month, still stayed below the threshold, indicating that the raw material inventory for manufacturing production reduced. Supplier delivery time index was 50.9 percent, increased 0.5 percentage points month-on-month, and continued to stayed above the threshold, indicating that the delivery time of manufacturing raw material suppliers had been accelerated continually. Purchasing Managers Index (PMI) is an index summarized and compiled through the results of the monthly survey of enterprises purchasing managers. It covers every links of the enterprises, including purchasing, production, logistics, and so on. It is one of the leading indices which was commonly adopted by international society to monitor the macroeconomic trends, and played an important role in forecasting and monitoring. The threshold of PMI is usually using 50 percent as the cut-off point for economic performance. If PMI above 50 percent, it reflects the manufacturing economy is expanding; if less than 50 percent, it reflects the manufacturing economy is in recession. The survey involves 31 divisions of manufacturing sector in the “Industrial Classification for National Economic Activities” (GB/T4754-2011). The survey sample was expanded from 820 to 3000 since January 2013. PPS (Probability Proportional to Size) sampling method was adopted in manufacturing purchasing managers’ survey. Using the divisions of the manufacturing sector as the selecting strata, the sample size of each division is proportional to its proportion of the value-added of the division to the total value-added of the manufacturing sector. Within the stratum, the samples are selected according to the probabilities proportional to their principal business revenues of the enterprises. The survey was organized and conducted by staff members of survey offices, monthly through Online Reporting System of NBS by sending survey questionnaires to the purchasing managers of the selected enterprises. The questionnaire of manufacturing purchasing managers survey covers 12 questions related to production, new orders, export orders, existing orders, finished goods inventory, purchase, import, purchase prices, raw materials, inventory, employees, suppliers, delivery time, production and business activities expectation and etc.. Diffusion index was calculated for each question, i.e. percentage of positive answers in number of enterprises plus half of the percentage in the same answers. PMI is a composite index, which was calculated according to five diffusion indices (group indices) and their weights. 5 group indices and their weights are determined in accordance with their leading impact on the economy. Specifically, new orders index weighted 30 percent; production index weighted 25 percent; employees index weighted 20 percent; supplier delivery time index weighted 15 percent; raw materials inventory index weighted 10 percent. Of which, the supplier delivery time index is a converse index, and contrary calculation is needed when combines it into PMI. The purchasing managers’ survey is a monthly survey, the data of the survey fluctuates very much for the influences of seasonal factors. The released PMI composite index and sub-indices are seasonally adjusted data.